Reptiles in the pet trade are prone to being very stressed and sometimes ill. There are some specific things to watch out for when choosing a pet red-eared slider to help ensure your turtle isn't sick before you even get it home. The following tips should help you assess the level of stress and health in a potential pet red-eared slider. Assess the red-eared slider's demeanor. Red-eared sliders should appear bright, alert and responsive. When you pick up a turtle it will most likely pull its legs into its shell. If a turtle appears lethargic and not responsive it is most likely ill and weak (turtles kept in cool conditions will be slow and lethargic as a result but be careful since these reptiles may also be stressed or ill due to improper environmental conditions). Look at the overall body condition of the turtle. Red-eared sliders should be full-bodied and when you pick them up they shouldn't feel like an empty shell. On the other hand, they should not have rolls of skin and fat around their legs, either. Their shells should be intact and smooth. Look at the skin and shell more closely. The skin should be supple and free of bites and scratches (these could form abscesses later on). While a bit of loose skin may hang off during shedding, the skin should look normal and not irritated where it shed. Turtles should have hard, smooth shells with no defects. Sores, cuts, or abrasions on the shell could become infected while soft shells are a sign of metabolic bone disease. Also, avoid any turtles with cracked or broken shells since these injuries are extremely serious. Check for overall cleanliness in the red-eared slider tank where you are looking at purchasing a turtle. Turtles kept in crowded or unsanitary conditions may be stressed and more prone to illness. Check the eyes. They should be open, clean, clear and free of discharge or crusted material. Swollen eyes or eyes that are continually held shut are signs of illness in red-eared sliders and other turtles. Watch out for discharge or mucous around the nostrils which can be signs of a respiratory illness. Check the mouth. The inside of most reptiles mouths are a healthy pink color and are smooth. A pale pink or grey color in the mouth, or the presence of small yellow, white or green patches on the tongue or inside of a turtle's mouth are signs of illness and/or mouth rot. Also be wary if the saliva is stringy or thick. Check the rest of the head for any swelling or asymmetry (both sides of the head and jaw should look the same). Swelling or asymmetry of the jaws is can be an indicator of metabolic bone disease. Other lumps or swellings may be abscesses or indicate the presence of general infections or illness. Look for signs of respiratory disease including discharge from the eyes or nose, open-mouthed breathing, or a clicking, wheezing, or bubbly sounds when the turtle breathes. Lopsided swimming is also a sign of respiratory infections in red-eared sliders. Watch the red-eared sliders move. Movements (on land or in water) should be strong and smooth. Weakness or shakiness can be a sign of illness and twitches or tremors may indicate the presence of metabolic bone disease. Always try to find a captive bred red-eared slider. Wild caught reptiles are likely to be extremely stressed and possibly ill as a result (they tend to be carrying a high parasite load at the very least). Even better, try to find a red-eared slider at a rescue or shelter. Avoid the temptation to "rescue" a red eared slider that is clearly ill or being looked after improperly at a shop. While it is a noble thing to do, consider that the one you buy will probably just be replaced with another that will be stressed and/or neglected in the same way. That is in addition to the cost of you providing health care to the rescued reptile and the potential heartache if your rescue dies. Do, however, consider reporting the seller to a local animal welfare authority. Have everything you need set up completely at home before getting a red-eared slider. Going to a new environment is stressful enough and you don't want to be fiddling with setting up a tank and getting temperatures right after bringing your turtle home. Have everything ready and "perfect" for the new arrival. This means you'll need to thoroughly research the needs of your pet well before you buy them and avoid impulse purchases. 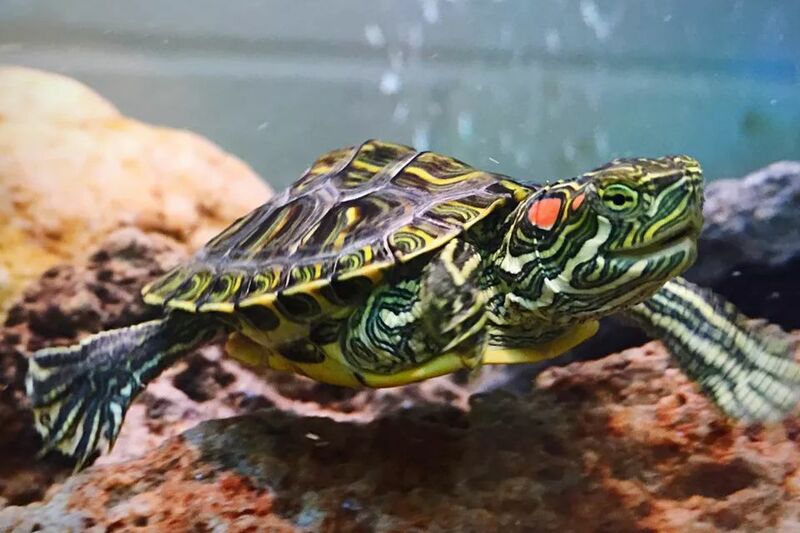 If a red-eared slider appears to be in good condition but is kept under poor conditions (improper temperatures or lighting, overcrowding, dirty tank, etc.) be wary. The stress of improper care may make the reptile susceptible to illnesses that might not be apparent until later when you have the turtle at home. Knowing about the proper care of red-eared sliders before you go shopping makes it possible to evaluate how well the reptile is being cared for by the seller. How Do Care For a Full Grown Red-Eared Slider? Do African Side-Neck Turtles Make Good Pets? How Do You Care for a Pet Painted Turtle? What Do Red Eared Slider Turtles Eat? What Should I Feed My Red-Eared Slider Turtle?